Getting your wisdom teeth taken out is such a common procedure that over 90% of Americans undergo the surgery. But why is it important that these late-blooming teeth come out? Can’t they just stay in there? Well, sometimes they can, but if it’s recommended that they be removed, it’s to keep you from additional problems. At our dental office in Mill Creek, we want to make sure all of our patients understand that there are important reasons we often recommend wisdom teeth extraction. The top reason most wisdom teeth need to be removed is the lack of room remaining in the mouth. If there isn’t enough space for the teeth to fully erupt, other teeth may shift and your bite may suffer. 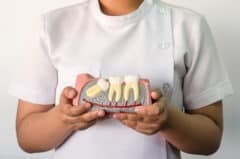 When problems with the bite occur, a whole host of other issues can follow including TMJ pain, headaches, neck and shoulder pain, and loose teeth. Another reason wisdom teeth need to be removed is that these teeth are waaay back there, making them difficult to care for properly. This means that your wisdom teeth are at increased risk for things like gum disease and cavities. If your wisdom teeth have already erupted, it’s important that you see a dentist so they can check for any decay or disease. If anything troublesome is found, the most logical solution may be to remove them and avoid continued issues. Another problem with not having enough space for the teeth to erupt properly is that they can get stuck in the bone. This is referred to as having impacted wisdom teeth. Once the teeth are impacted, treatment tends to become more complicated, so it’s best to catch any potential problems with wisdom teeth and remove them early. If your wisdom teeth do become impacted, your Mill Creek dentist will talk to you about the most appropriate treatment to help. The only way you should keep your wisdom teeth is if you have plenty of room, they’re healthy, and you’re able to care for them properly. If checkups at our dental office in Mill Creek show that your fully erupted wisdom teeth are becoming unhealthy, or that your yet-to-erupt teeth will not have enough room, we will probably recommend getting them removed to keep your mouth in its best, healthiest shape. Serving patients in Mill Creek, Bothell, Everett and beyond.